Rick’s Chicken and Shellfish Paella | When I Survey . . .
My seminary classmate Carlos Diaz gave us a paella pan and the Time-Life Cooking of Spain cookbook for a wedding present. That was forty years ago and paella has been a mainstay of my kitchen for special events. I made one last night for a family birthday. The original Time-Life recipe was a lovely Valencia style paella with some not very authentic ingredients such as lobster. Paella was originally a humble peasant dish of saffron infused rice with whatever fresh vegetables and fish or game that was available. This elaborate Valencia style paella is the one most Americans know from restaurants. This is my take on it with four decades of my tweaks. It is pretty labor intensive, but a fun project in the kitchen, and the results are unfailingly crowd-pleasing. Serves six with generous portions. 1 red bell pepper, halved, cored and cut in ¼ inch wide strips about 2 inches long. Peel the shrimp, retaining the shells. Put the shells into a pot with six cups of water, and bring to a boil, then keep it at a light simmer while you work on the recipe. Salt and pepper the chicken. Put 1 TB olive oil in a 12 inch non-stick frying pan and brown half the chicken, adjusting the heat so it browns nicely but doesn’t burn. Remove the browned chicken to a plate and brown the other half, then put it on the plate. Brown the sausage in the pan, and then put it on a plate over a paper towel. The next step is to make what the Spanish call a sofrito. To do this place the remaining olive oil in the pan and brown the diced pork over high heat stirring constantly. Then add the garlic, onion, tomato and red pepper strips to the pan and stir constantly until most of the liquid is boiled off and the mixture is firm enough to hold its shape on a spoon. For the next step you need a big oven-proof pan, at least 14 inches wide and a couple of inches high. I use a well-seasoned 14 inch cast iron pan. Pre-heat your oven to 400 degrees. Drain the shrimp stock through a fine strainer into another pot and top off with water to make six cups if needed. Bring it back to a boil. Grind the saffron with a mortar and pestle. Place the sofrito mixture, the rice, and the six cups of the boiling shrimp stock into the big pan, add the saffron and smoked paprika. Pour a little boiling water into the mortar to get the last bit of saffron. Bring it all to a boil over high heat stirring constantly, and as soon as it boils turn off the heat. To construct the paella place the chicken, sausage, and shrimp into the rice mixture. Place the clams and mussels in the rice with their open ends up. Sprinkle the peas over the top. Place the paella in the oven and cook it for 25 minutes. Then check the rice and if necessary cook it for another five minutes. Remove the paella from the oven and place it on a trivet on the table. Cover it with a clean dish towel for ten minutes and serve. I serve a Rioja or other tempranillo based Spanish red with this, but you could also serve an Albariño or other Spanish white. 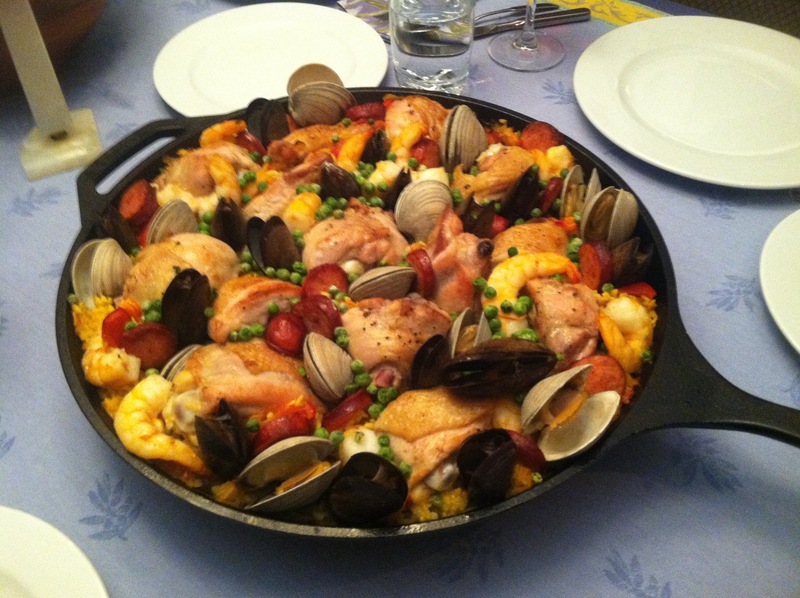 This entry was posted in Cooking, Food, Recipes and tagged cooking, paella, recipes, rice dishes, Spanish cooking. Bookmark the permalink.